This article is about the film. For the trading card series, see Mars Attacks. Mars Attacks! is a 1996 American comic science fiction film directed by Tim Burton, who also co-produced it with Larry J. Franco. The screenplay, which was based on the cult trading card series of the same name, was written by Jonathan Gems. The film features an ensemble cast consisting of Jack Nicholson (in a dual role), Glenn Close, Annette Bening, Pierce Brosnan, Danny DeVito, Martin Short, Jack Black, Sarah Jessica Parker, Michael J. Fox, Rod Steiger, Pam Grier, Ray J, Tom Jones, Lukas Haas, Natalie Portman, Jim Brown, Joe Don Baker, Lisa Marie Smith, Brandon Hammond and Sylvia Sidney. Alex Cox had tried to make a Mars Attacks film in the 1980s before Burton and Gems began development in 1993. When Gems turned in his first draft in 1994, Warner Bros. commissioned rewrites from Gems, Burton, Scott Alexander and Larry Karaszewski in an attempt to lower the budget to $60 million. The final production budget came to $80 million, while Warner Bros. spent another $20 million on the Mars Attacks! marketing campaign. Filming took place from February to November 1996. The film was shot in California, Nevada, Kansas, Arizona and Argentina. The filmmakers hired Industrial Light & Magic to create the Martians using computer animation after their previous plan to use stop motion animation, supervised by Barry Purves, fell through because of budget limitations. Mars Attacks! was released theatrically by Warner Bros. Pictures in the United States on December 13, 1996 and received mixed reviews from critics. The film is now considered a cult film. The film grossed approximately $101 million in box office totals, which was seen as a disappointment at the time. Mars Attacks! was nominated for the Hugo Award for Best Dramatic Presentation and earned multiple nominations at the Saturn Awards. In Kentucky, a family watches in confusion as a herd of cattle on fire starts running past their home. A spaceship is then seen departing Earth and returning to Mars, where it gathers hundreds of other Martian ships and heads back to Earth. President James Dale, along with his aides, addresses the United States concerning the historic event. Several days later, the President's science aides set up a first contact meeting with the Martians in Nevada, as President Dale watches the development on TV with his wife Marsha and his daughter Taffy. Using a translation machine, the Ambassador of Mars announces that they "come in peace". When a hippie releases a dove as a symbol of peace, the Ambassador shoots it before he and the other Martians slaughter most of the people at the event, including General Casey, news reporter Jason Stone and Billy-Glenn Norris, before capturing chat-show host Nathalie Lake and her pet chihuahua. Thinking that the Martians assumed that the dove was a symbol of war, the President tells Professor Donald Kessler to renegotiate with the Martians, whose ambassador later requests to address the United States Congress. At this meeting, the Martians massacre most of Congress. Kessler begs the Martian ambassador to stop, but is knocked unconscious and taken aboard their ship, where he is later shown with his body parts dismembered and his disembodied head remaining animated. General Decker tries to convince President Dale to retaliate with nuclear warfare, but the President refuses. After a failed attempt to assassinate President Dale in which a disguised Martian is killed, the Martians invade Earth in droves, starting with Washington, D.C. and quickly spreading around the globe. As they attack the White House, the Secret Service evacuates the President, but the First Lady is crushed to death by the Nancy Reagan chandelier and Taffy, the president's daughter, is separated from them during the chaos. After the President of France is assassinated by the Martians that night, the U.S. government attempts a nuclear attack on the Martian mothership, but that proves futile and the Martians continue destroying Earth and start defacing and vandalizing world landmarks. Eventually, the Martian leader and his bodyguards breach the bunker where Dale has been taken and the former reduces Decker to the size of an insect before killing him. The Martians kill everyone else in the bunker except for Dale, who makes an impassioned speech in an attempt to plea for peace and his life. The Martian leader appears to be moved by the speech and deceptively appears to agree to a truce with Dale, but then uses a gadget disguised as a hand to kill him. As the Martians ravage Las Vegas, Byron Williams, a former world champion boxer, leads a small group of survivors consisting of Barbara Land, Tom Jones, a waitress named Cindy and a lawyer to an airfield in the hopes of flying a small jet procured by Land to safety. They barely make it, losing the lawyer in the process, but discover a large group of Martians stationed there as they are preparing to take off, the ambassador among them. Byron creates a diversion by challenging them to a fistfight. While he succeeds in killing the ambassador, he is outnumbered and overwhelmed, but Tom, Barbara and Cindy escape. Billy-Glenn's brother Richie discovers that the Martians' heads explode when they hear Slim Whitman's "Indian Love Call" when he goes to rescue his grandmother, Florence. Richie and Florence then drive around town, using the song to kill Martians, and broadcast the song on a local radio station. Thereafter, armed forces broadcast the song around the globe, killing the Martian leader and most, if not all, of the other Martians. Nathalie and Kessler's disembodied heads kiss while the Martian spaceship they are on crashes into the ocean. In the aftermath, Taffy awards Richie and Florence the Medal of Honor. Byron, who survived the Martian brawl, arrives in D.C. to reunite with his former wife and their two sons as the devastation is being cleaned up. Barbara, Cindy and Jones emerge from a cave with some wild animals to see dozens of crashed Martian ships in Lake Tahoe. In 1985, Alex Cox pitched the idea of a film based on the Mars Attacks trading card series as a joint-production to Orion and Tristar Pictures. He wrote three drafts over the next four years, but was replaced by Martin Amis before Orion and Tristar placed Mars Attacks in turnaround. 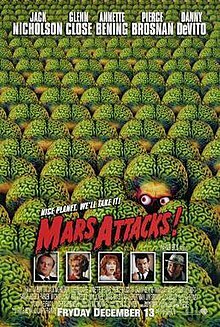 Jonathan Gems, who had previously written multiple unproduced screenplays for director Tim Burton, came up with his own idea for a Mars Attacks film in 1993. The writer pitched both concepts of Mars Attacks and Dinosaurs Attack! to Burton, who both decided that Dinosaurs Attack! would be too similar to Jurassic Park (1993). Burton, who was busy preparing Ed Wood (1994), believed that Mars Attacks! would be a perfect opportunity to pay homage to the films of Edward D. Wood, Jr., especially Plan 9 from Outer Space (1959), and other 1950s science fiction B movies, such as Invaders from Mars (1953), It Came from Outer Space (1953), The War of the Worlds (1953), Target Earth (1954), Invasion of the Body Snatchers (1956) and Earth vs. the Flying Saucers (1956). Burton set Mars Attacks! up with Warner Bros. and the studio purchased the film rights to the trading card series on his behalf. The original theatrical release date was planned for the summer of 1996. Gems completed his original script in 1994, which was budgeted by Warner Bros. at $260 million. The studio wanted to make the film for no more than $60 million. After turning in numerous drafts in an attempt to lower the budget, Gems was replaced by Ed Wood writers Scott Alexander and Larry Karaszewski. Gems eventually returned to the project, writing a total of 12 drafts of the script. Although he is credited with both the screen story and screenplay of Mars Attacks!, Gems dedicates his novelization of the movie to Burton, who "co-wrote the screenplay and didn't ask for a credit". Warner Bros. was dubious of the Martian dialogue and wanted Burton to add closed captioning subtitles, but he resisted. Working with Burton, Gems pared the film's 60 leading characters down to 23 and the worldwide destruction planned for the film was isolated to three major cities. Scenes featuring Martians attacking China, the Philippines, Japan, Europe, Africa, India and Russia were deleted from the screenplay. "Bear in mind this was way before Independence Day (1996) was written," Gems commented. "We had things like Manhattan being destroyed building by building, the White House went and so did the Empire State Building. Warner Bros. figured all this would be too expensive, so we cut most of that out to reduce the cost." Further discussing the differences between Mars Attacks! and Independence Day, Gems stated, "Independence Day is more like a movie called Fail-Safe and Mars Attacks is like Dr. Strangelove", in that both films had a similar story, but with different tones. Howard Stern claimed that the film's climax, where an attack by Martians was thwarted by playing Slim Whitman songs to them, was originally created by him when he worked at WNBC in 1982, in a sketch named "Slim Whitman vs. The Midget Aliens From Mars." As Burton listened to the sketch while being interviewed by Stern, he dismissed it as mere coincidence. The decision to hire an A-list ensemble cast for Mars Attacks! parallels the strategy Irwin Allen used for his disaster films, notably The Poseidon Adventure (1972) and The Towering Inferno (1974). Jack Nicholson, approached for the role of the President, jokingly remarked that he wanted to play all the roles. Burton agreed to cast Nicholson as both Art Land and President Dale, specifically remembering his positive working relationship with the actor on Batman. Susan Sarandon was originally set to play Barbara Land before Annette Bening was cast. Bening modeled the character after Ann-Margret's performance in Viva Las Vegas (1964). Hugh Grant was the first choice for Professor Donald Kessler, which eventually went to Pierce Brosnan. Meryl Streep, Diane Keaton and Stockard Channing were considered for First Lady Marsha Dale, but Glenn Close won the role. In addition to Nicholson, other actors who reunited with Burton on Mars Attacks! include Sylvia Sidney from Beetlejuice (1988), O-Lan Jones from Edward Scissorhands (1990) and Danny DeVito from Batman Returns (1992), continuing Burton's trend of recasting actors several times from his previous works. The originally scheduled start date was mid-August 1995, but filming was delayed until February 26, 1996. Director Tim Burton hired Peter Suschitzky as the cinematographer, because he was a fan of his work in David Cronenberg's films. Production designer Thomas Wynn (A Beautiful Mind, Malcolm X) intended to have the war room pay tribute to Dr. Strangelove (1964). During production, Burton insisted that the art direction, cinematography and costume design of Mars Attacks! incorporate the look of the 1960s trading cards. On designing the Martian (played by Burton's girlfriend Lisa Marie Smith) who seduces and kills Jerry Ross (Martin Short), costume designer Colleen Atwood took combined inspiration from the playing cards, Marilyn Monroe, the work of Alberto Vargas and Jane Fonda in Barbarella (1968). Filming for Mars Attacks! ended on June 1, 1996. The film score was composed by Burton's regular composer Danny Elfman, to whom Burton was reconciled after a quarrel that occurred during The Nightmare Before Christmas (1993), for which they did not co-operate in producing Ed Wood (1994). Elfman enlisted the help of Oingo Boingo lead guitarist Steve Bartek to help arrange the compositions for the orchestra. The Martians were created using computer-generated imagery from ILM. Tim Burton initially intended to use stop motion animation to feature the Martians, viewing it as a homage to the work of Ray Harryhausen, primarily Jason and the Argonauts. Similar to his own Beetlejuice, Burton "wanted to make [the special effects] look cheap and purposely fake-looking as possible." He first approached Henry Selick, director of The Nightmare Before Christmas, to supervise the stop motion work, but Selick was busy directing James and the Giant Peach, also produced by Burton. Despite the fact that Warner Bros. was skeptical of the escalating budget and had not yet greenlit the film for production, Burton hired Barry Purves to shepherd the stop motion work. Purves created an international team of about 70 animators, who worked on Mars Attacks! for eight months and began compiling test footage in Burbank, California. The department workers studied Gloria Swanson's choreography and movement as Norma Desmond in Sunset Boulevard for inspiration on the Martians' movement. When the budget was projected at $100 million (Warner Bros. wanted it for no more than $75 million), producer Larry J. Franco commissioned a test reel from Industrial Light & Magic (ILM), the visual effects company he worked with on Jumanji. Burton was persuaded to change his mind to employ computer animation, which brought the final production budget to $80 million. Although Purves was uncredited for his work, stop motion supervisors Ian Mackinnon and Peter Saunders, who would later collaborate with Burton on Corpse Bride, received character design credit. Warner Digital Studios was responsible for the scenes of global destruction, airborne flying saucer sequences, the Martian landing in Nevada and the robot that chases Richie Norris in his pickup truck. Warner Digital also used practical effects, such as building scale models of Big Ben and other landmarks. The destruction of Art Land's hotel was footage of the real life nighttime demolition of the Landmark Hotel and Casino, a building Burton wished to immortalize. The movie’s opening sequence, which depicts the saucers leaving Mars and flying to Earth, "measured some 5,000 frames long and was created almost entirely by computer graphics. While the first shot showing a lone reconnaissance ship leaving earth was handled by ILM, the tour de force sequence’s remaining 12 shots were all done by Warner Digital...On Mars, irises open over the craters dotting the craggy surface, emitting hundreds of thousands of saucers that assume battle formations and head for Earth." The film's music was composed by Danny Elfman. The soundtrack was released on March 4, 1997 by Atlantic Records. All music composed by Danny Elfman (except "Indian Love Call", performed by Slim Whitman and "It's Not Unusual", performed by Tom Jones). Warner Bros. spent $20 million on the movie's marketing campaign; together with $80 million spent during production, the final combined budget came to $100 million. A novelization, written by screenwriter Jonathan Gems, was published by Puffin Books in January 1997. The film was released in the United States on December 13, 1996, earning $9.38 million in its opening weekend. Mars Attacks! eventually made $37.77 million in U.S. totals and $63.6 million elsewhere, coming to a worldwide total of $101.37 million. The film was considered a box office bomb in the U.S., but generally achieved greater success both critically and commercially in Europe. Many observers found similarities with Independence Day, which also came out in 1996. "It was just a coincidence. Nobody told me about it. I was surprised how close it was," director Tim Burton continued, "but then it's a pretty basic genre I guess. Independence Day was different in tone – it was different in everything. It almost seemed like we had done kind of a Mad magazine version of Independence Day." During the film's theatrical run in January 1997, TBS purchased the broadcasting rights of the film. Mars Attacks! drew mixed responses from critics. Based on 81 reviews collected by Rotten Tomatoes, 53% of the reviewers enjoyed the film, with an average score of 6/10. The critical consensus reads: "Tim Burton's alien invasion spoof faithfully recreates the wooden characters and schlocky story of cheesy '50s sci-fi and Ed Wood movies -- perhaps a little too faithfully for audiences." By comparison, Metacritic calculated an average score of 52/100 from 19 reviews. Roger Ebert observed the homages to the 1950s science fiction B movies. "Ed Wood himself could have told us what's wrong with this movie: the makers felt superior to the material. To be funny, even schlock has to believe in itself. Look for Infra-Man (1975) or Invasion of the Bee Girls (1973) and you will find movies that lack stars and big budgets and fancy special effects but are funny and fun in a way that Burton's megaproduction never really understands." Kenneth Turan of the Los Angeles Times wrote that "Mars Attacks! is all 1990s cynicism and disbelief, mocking the conventions that Independence Day takes seriously. This all sounds clever enough but in truth, Mars Attacks! is not as much fun as it should be. Few of its numerous actors make a lasting impression and Burton's heart and soul is not in the humor". Desson Thomson from The Washington Post said "Mars Attacks! evokes plenty of sci-fi classics, from The Day the Earth Stood Still (1951) to Dr. Strangelove (1964), but it doesn't do much beyond that superficial exercise. With the exception of Burton's jolting sight gags (I may never recover from the vision of Sarah Jessica Parker's head grafted on to the body of a chihuahua), the comedy is half-developed, pedestrian material. And the climactic battle between Earthlings and Martians is dull and overextended." Richard Schickel, writing in Time magazine, gave a positive review. "You have to admire everyone's chutzpah: the breadth of Burton's (and writer Jonathan Gems') movie references, which range from Kurosawa to Kubrick; and above all their refusal to offer us a single likable character. Perhaps they don't create quite enough deeply funny earthlings to go around, but a thoroughly mean-spirited big-budget movie is always a treasurable rarity." Jonathan Rosenbaum from the Chicago Reader praised the surreal humor and black comedy, which he found to be in the vein of Dr. Strangelove and Gremlins (1984). He said it was far from clear whether the movie was a satire, although critics were describing it as one. Todd McCarthy of Variety called Mars Attacks! "a cult sci-fi comedy miscast as an elaborate, all-star studio extravaganza." Mars Attacks! was on the shortlist for the Academy Award for Best Visual Effects nomination, but the Academy of Motion Picture Arts and Sciences chose Independence Day, Dragonheart and Twister instead. The film was nominated for seven categories at the Saturn Awards. Danny Elfman won Best Music, while director Tim Burton, writer Jonathan Gems, actor Lukas Haas, costume designer Colleen Atwood and the visual effects department at Industrial Light & Magic received nominations. Mars Attacks! was nominated for both the Saturn Award for Best Science Fiction Film (which went to Independence Day) and the Hugo Award for Best Dramatic Presentation. ^ Gates, Anita (December 15, 1996). "Mars Attacks!". The New York Times. Retrieved June 2, 2018. ^ Fountain, Clarke. "Mars Attacks!". Allmovie. Retrieved October 5, 2012. ^ Alex Cox. "Writing". Archived from the original on 2014-04-17. Retrieved 2014-09-17. ^ a b c d e f g h i j k l m Mark Salisbury; Tim Burton (2006). "James and the Giant Peach, Mars Attacks!, Superman Lives and The Melancholy Death of Oyster Boy". Burton on Burton. London: Faber and Faber. pp. 145–163. ISBN 0-571-22926-3. ^ a b c d e f g Christine Spines (January 1997). "Men Are From Mars, Women Are From Venus". Premiere. ^ a b Susan Stark (1996-12-07). "Director Tim Burton Rebels In His New Space Comedy". The Detroit News. ^ Cindy Pearlman (1996-12-08). "Today, Vegas: Tomorrow, The World! Mean Little Green Guys Attack Earth". Chicago Sun-Times. ^ a b Anthony C. Ferrante (March 1997). "Hidden Gems". Fangoria. ^ Henry Sheehan (1996-12-27). "Yak-Yak Is Way Martians Communicate". The Orange County Register. ^ Ferrante, Anthony C. (January 1997). "Duck for Cover when Mars Attacks". Fangoria (159): 30–35, 79. ^ a b c Jeff Gordinier (1996-02-23). "Jack's Back". Entertainment Weekly. Retrieved 2008-05-30. ^ a b Staff (1995-07-28). "Target Hollywood". Entertainment Weekly. Retrieved 2008-05-30. ^ a b "About the Production . ." Warner Bros. Retrieved 2009-04-14. ^ Ken Hanke (1999). "A Plan 9 of His Own". Tim Burton: An Unauthorized Biography of the Filmmaker. Los Angeles: Renaissance Books. pp. 183–92. ISBN 1-58063-162-2. ^ Richard Natale (1997-11-21). "Art of fantasy". Variety. Retrieved 2009-04-13. ^ a b Staff (1996-08-23). "Fall Movie Preview: December". Entertainment Weekly. Retrieved 2008-05-30. ^ Magid, Ron. “Attack Formation” in Cinescape, Volume 3, Number 4. Lombard, IL: MVP Entertainment, Inc., January/February 1997. ^ Miller 2016, pp. 185-186. ^ "Mars Attacks! (1996) — Art of the Title". Artofthetitle.com. 1996-12-13. Retrieved 2017-01-12. ^ Bernard Weinraub (1997-01-02). "Season of Many Movies, but Not Many Hits". The New York Times. ^ "Mars Attacks! : A Novelization (Paperback)". Amazon.com. Retrieved 2009-04-14. ^ "Mars Attacks!". Box Office Mojo. Retrieved 2009-04-14. ^ Edwin Page (2007). "Mars Attacks!". Gothic Fantasy: The Films of Tim Burton. London: Marion Boyars Publishers. pp. 143–158. ISBN 0-7145-3132-4. ^ John Dempsey (1997-01-23). "USA Network trumps net window for six features". Variety. Retrieved 2009-04-13. ^ "Mars Attacks!". Rotten Tomatoes. Retrieved 2009-04-14. ^ "Mars Attacks! (1996): Reviews". Metacritic. Retrieved 2009-04-14. ^ Roger Ebert (1996-12-13). "Mars Attacks!". Chicago Sun-Times. Retrieved 2009-04-15. ^ Kenneth Turan (1996-12-13). "Mars Attacks! Tim Burton's Plan 9". Los Angeles Times. Retrieved 2009-04-15. ^ Desson Thomson (1996-12-13). "Mars Attacks! We Lose". The Washington Post. Retrieved 2009-04-15. ^ Richard Schickel; Richard Corliss (1996-12-30). "A Rich Film Feast". Time. Retrieved 2009-04-15. ^ Jonathan Rosenbaum. "Flirting With Disaster". Chicago Reader. Retrieved 2009-04-15. ^ Todd McCarthy (1996-12-02). "Mars Attacks!". Variety. Retrieved 2009-04-16. ^ Andrew Hindes (1997-01-09). "7 pix set to vie for 3 Oscar f/x noms". Variety. Retrieved 2009-04-12. ^ "Past Saturn Awards". Academy of Science Fiction, Fantasy & Horror Films. Archived from the original on 2011-05-12. Retrieved 2007-04-14. ^ "1997 Hugo Awards". The Hugo Awards Organization. Retrieved 2009-04-13. Jonathan Gems (January 1997). Mars Attacks!. Novelization of the film. London: Puffin Books. ISBN 978-0-14-038587-8. Karen Jones (November 1996). Mars Attacks! The Art of the Movie. Del Rey Books. ISBN 978-0-345-40998-0. Thomas Kent Miller. Mars in the Movies: A History. Jefferson, North Carolina: McFarland & Company, 2016. ISBN 978-0-7864-9914-4. Ron Magid. “Attack Formation” in Cinescape, Volume 3, Number 4. Lombard, IL: MVP Entertainment, Inc., January/February 1997. Wikimedia Commons has media related to Mars Attacks!.